There was religious freedom for Catholics during Nazi Germany per the terms of the Concordat Between the Holy See and the German Reich. "I learned much from the Order of the Jesuits", said Hitler... "Until now, there has never been anything more grandiose, on the earth, than the hierarchical organization of the Catholic Church. I transferred much of this organization into my own party... I am going to let you in on a secret... I am founding an Order... In my "Burgs" of the Order, we will raise up a youth which will make the world tremble... Hitler then stopped, saying that he couldn't say any more.." Hermann Rauschning, former national-socialist chief of the government of Dantzig: "Hitler m'a dit", (Ed. Co-operation, Paris 1939, pp.266, 267, 273 ss). Who was the Black Pope at this time? Pius XI in the late 30s made a monumental move: the first writing of an Encyclical which at least in part denounced racial anti-Semitism. It is referred to as "the hidden Encyclical". Pius XI requested American Jesuit Msgr LaFarge to draft the statement which upheld traditional Catholic doctrine against Jewish doctrine but decried racism against the Jews, and countered at least part of the intent of the 1933 Vatican Concordat with Nazi Germany. 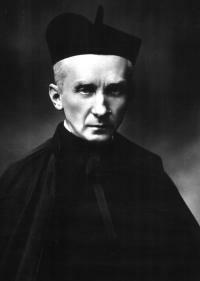 Ledochowski was the austere politician and Jesuit General at the time, and he was not in favor of the new document. It mysteriously disappeared and Pius died before the signing, although it was one of the last documents on his desk. The document: Humani Generis Unitas, or "The Unity of the Human Race" might have made a difference in the Vatican's allowance of the Third Reich's policies. Pius died, Pius XII, more a politician and diplomat than theologian and with ties to Germany and von Papen took office rapidly. Ledochowski is credited with being instrumental in the suppression of the document. 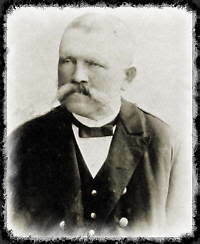 Alois Hitler (born Aloys Schicklgruber June 7, 1837 – January 3, 1903) was the father of Adolf Hitler. Baptized Roman Catholic at infancy. Remained Roman Catholic his whole life. 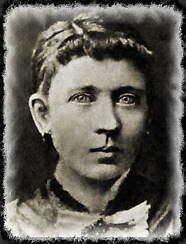 Klara Hitler, born Klara Pölzl (August 12, 1860 - December 21, 1907), was the mother of Adolf Hitler by her husband Alois. She was a devout Roman Catholic and went to church regularly. Tombstone of both of Hitler's parents on Catholic church property. It was removed due to white nationalists congregating next to it repeatedly. July 1897: [Hitler] Enrolled in the monastery’s choir and school, Adolf continues to do well, achieving the Austrian equivalent of ‘Straight A’s." He will later recall: "Since in my free time I received singing lessons in the cloister at Lambach, I had excellent opportunity to intoxicate myself with the solemn splendor of the brilliant church festivals. It seemed to me perfectly natural to regard the abbot as the highest and most desirable ideal, just as my father regarded the village priest as his ideal." Munich, 1933. 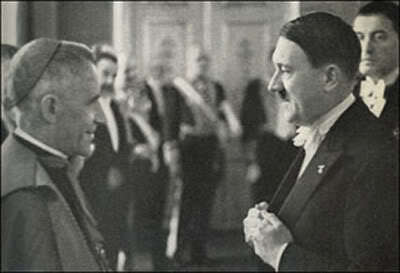 Hermann Esser , Adolf Hitler, politicians, NSDAP, welcomed the Apostolic Nuncio in Bayern, Alberto Vasallo di Torregrossa. To the right: Bavarian Economy Minister and chief of the Minister's Office, and the former Tsar Ferdinand of Bulgaria . Hitler Greets Reich Bishop Ludwig Müller and Abbott Albanus Schachleiter as Honorary Guests at the "Reich Party Rally for Unity and Strength" (September 4-10, 1934) He (Schachleiter) was one of the few Catholic clergymen who maintained contacts with the National Socialist movement even before Hitler's rise to power in 1933. 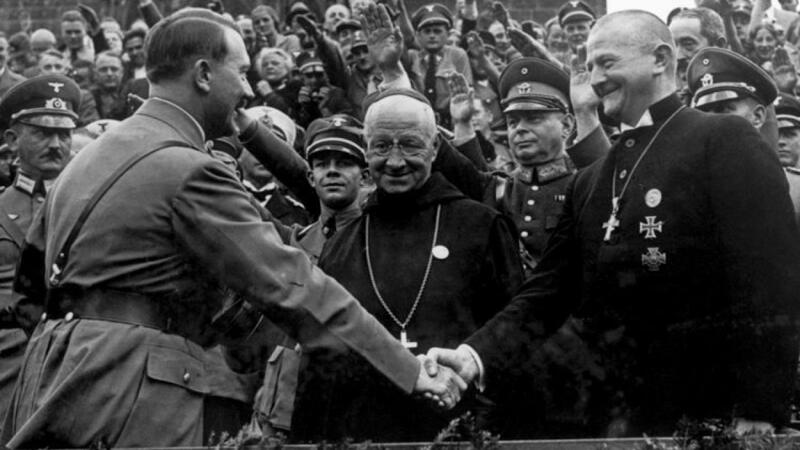 Adolf meeting with Cesare Orsenigo, the Papal Nuncio (the Personal Representative of the Pope). to Nazi Germany. One of many such meetings. 'Mein Kampf' written by Roman Catholic Priest Father Bernard Staempfle. After writing Mein Kampf for Adolf Hitler, Bernhard Stempfle was thrown into a concentration camp and then assassinated. 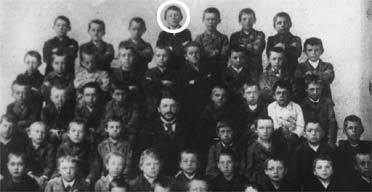 "In June 1934, having been deported to the Dachau concentration camp, his body was found in the woods near Harlaching. His death is attributed by some accounts to a broken neck and by others to shots in the heart "while trying to escape". There is disagreement also over the reasons for his murder. In some accounts, it is considered possible that he was regarded as having too much information about Hitler's past and personal life, and especially about the death of Hitler's niece, Geli Raubal. Other accounts hold that it was perhaps his attacks on Christian Weber, for immorality and running a brothel, that determined his fate." 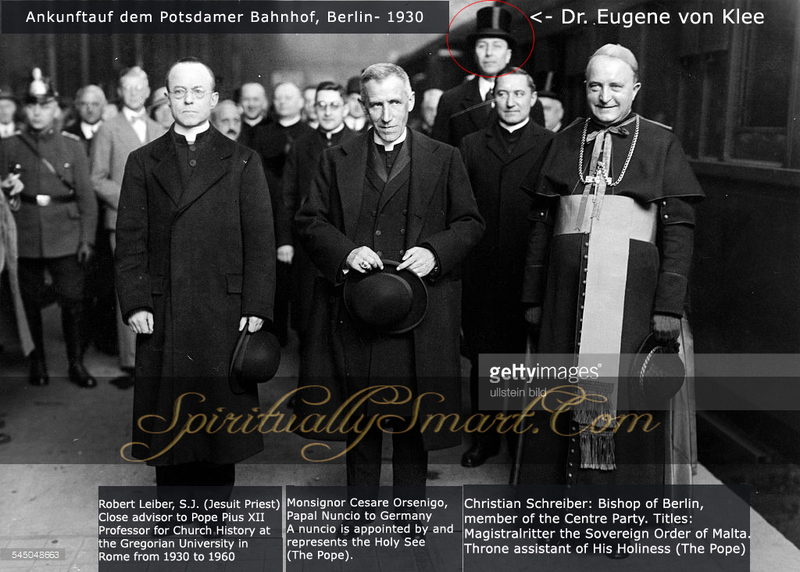 Prelate Ludwig Kaas (23 May 1881 – 15 April 1952) was a Roman Catholic priest, and a prominent German politician during the Weimar Republic. 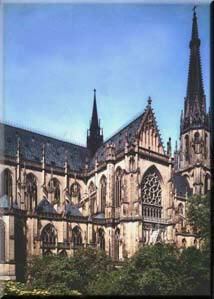 Born in Trier, Kaas was ordained a priest in 1906 and studied history and Canon law in Trier and Rome. 1906 he completed a doctorate in theology and in 1909 he obtained a second doctorate in philosophy. 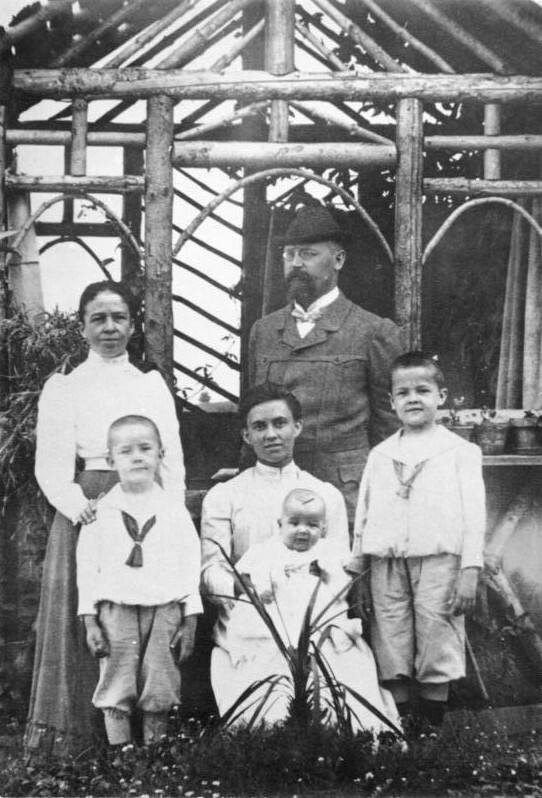 In 1910 he was appointed rector of an orphanage and boarding school near Koblenz. Until 1933, he devoted his spare time to scholarly pursuits. Later, Kaas would frequently travel to Rome, where he would stay with Pacelli, and and experience first hand the new Lateran Treaty, which he published on. In 1931 and 1932 continued as an advisor in negotiations for a Reichskonkordat), that however came to nothing (Until 1933). 1933 15 March, Kaas was the main advocate supporting the Hitler administration's Enabling Act in return for certain constitutional and, allegedly ecclesiastic guarantees. Hitler responded positively via Papen. This vote (for the enabling act) was a major step in the institution of the dictatorship of Adolf Hitler and is remembered as the prime example of a democracy voting for its own demise (just like the Patriot Act). Because of Kaas' request for guarantees and because of his later involvement in the Reichskonkordat negotiations. Kaas and Papen traveled together to Rome and had discussions on the train. Von Papen had assured Kaas, that a concordat with the new government was a sure thing. Kaas has worked on a Reichkoncordat for over ten years. Now Hitler offered it. "Kaas acted in co-ordination with the German bishops. Four days later, on March 28, the German bishops rescinded their ban on Nazi party membership. On April 1, Cardinal Adolf Bertram of Breslau addressed German Catholics in a letter, warning them "to reject as a matter of principle all illegal or subversive activities". To most Catholics, it looked as if the church wanted a modus vivendi with Hitler." "At a time when the heads of the major nations in the world faced the new Germany with cool reserve and considerable suspicion, the Catholic Church, the greatest moral power on earth, through the Concordat expressed its confidence in the new German government." Signing the Concordat is Cardinal Pacelli (later to become Pope Pius XII). By 1933, he was the Vatican Secretary of State. Far Left is Prelate Ludwig Kaas, leader of the Centre (Zentrum) Party). 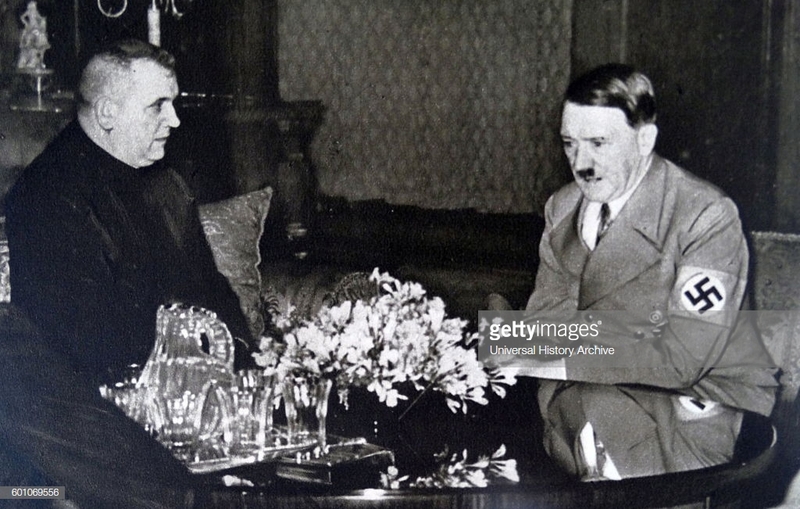 Seated second from his left is Franz von Papen who was a German nobleman, Catholic politician, General Staff officer, and diplomat, who served as Chancellor of Germany (Reichskanzler) in 1932.. Next to him is Guiseppe Parzardo. In the middle is Cardinal Pacelli who later became Pope Pius XII. 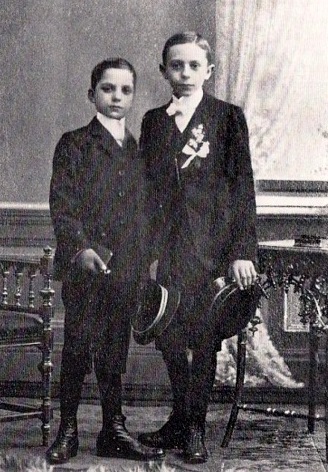 On his left is Caedinal Alfredo Ottaviani. Nezt to him is Rudolf Buttmann. Standing next to him is a little known Vatican prelate, Montini, later to become Pope Paul VI. 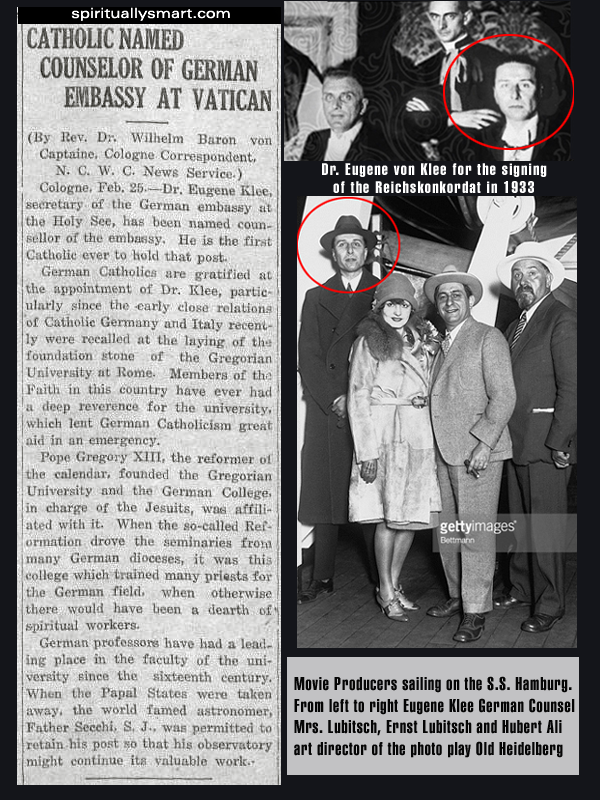 And finally next to Montini is Dr. Eugene von Klee who was the first Catholic German embassy councilor to Vatican City. Information about him is more sparse than anyone else in the image. On 30 January 1933 Adolf Hitler was appointed Chancellor. On 23 March 1933 his government was given legislative powers through the Enabling Act and was passed by all Reichstag except the Social Democrats and Communists (whose deputies had already been arrested). Hitler had obtained the votes of the Centre Party, led by Prelate Ludwig Kaas, by issuing oral guarantees of the party's continued existence and the autonomy of the Church and her educational institutions. He also promised good relations with the Holy See, which some interpret as a hint on a future concordat. In April, he sent his vice chancellor Franz von Papen, a Catholic nobleman and former member of the Centre Party, to Rome to offer negotiations about a Reichskonkordat. On behalf of Cardinal Pacelli, Ludwig Kaas, the out-going chairman of the Centre Party, negotiated the draft of the terms with Papen. The concordat was finally signed, by Pacelli for the Vatican and von Papen for Germany, on 20th July. One of Hitler's key conditions for agreeing to the concordat, in violation to earlier promises, had been the dissolution of the Centre Party, which occurred on July 6. The Reichskonkordat was ratified on September 10, 1933. In the Concordat, the German government achieved a complete proscription of all clerical interference in the political field (articles 16 and 32). It also ensured the bishops' loyalty to the state by an oath and required all priests to be Germans and subject to German superiors. Restrictions were also placed on the Catholic organisations. Shortly before signing the Reichskonkordat, Germany signed similar agreements with the major Protestant churches in Germany. Franz von Papen (Front Left) heads Catholic Mass Procession. Another well informed person, the mainspring of the pact between the Holy See and Berlin and the pope's secret chamberlain, Franz von Papen, was even more explicit: "The Third Reich is the first world power which not only acknowledges but also puts into practice the high principles of the papacy". (Robert d'Harcourt of the French Academy: "Franz von Papen, l'homme a tout faire" L'Aube, 3rd of October 1946). The Jesuits, orchestrated both the Major Axis powers and Minor Axis powers. Germany, Italy and Japan were the Major, the rest were Minor. Here is an excellent web page for further study on this matter. His father, Joseph Ratzinger, Sr., was an Ordnungspolizei. The Ordnungspolizei (OrPo) was the name for the uniformed regular German police force that existed in Nazi Germany between the years of 1936 and 1945. After their green uniforms, they were also referred to as Grüne Polizei (green police). Joseph Ratzinger, Sr., served in the Bavarian Landespolizei for several years as a rural policeman. Various sources state that the Ratzingers' views towards the National Socialist German Workers Party caused the family some hardship, including the family having to move several times in the 1930s. There is no evidence, however, that Joseph Ratzinger, Sr., was ever arrested for anti-Nazi tendencies. He continued to serve in the police even after such events as the Night of the Long Knives and the passing of the Nuremberg Laws. In 1936, Joseph Ratzinger, Sr., became a member of the Ordnungspolizei after all the police forces of Nazi Germany were incorporated into a national police force. In summer 1942 Georg Ratzinger was drafted to the Reichsarbeitsdienst, and the same autumn to the German Wehrmacht. In 1944 he was wounded in battle in Italy. At the end of World War II, he was a POW of the U.S. Army in the vicinity of Naples, but was released, and arrived at home in July of 1945. Here are some pictures of Dominican monks serving meals to Nazis. you can see how this could play a role in the conscience of the Nazi. The religion he grew up in was supporting their fascism. Who is more evil? The Roman catholic church of course! Although the nazis are not by ANY means innocent. "The inquisition was suggested by Dominic de Guzman and was begun in 1204." ... "It was hell's masterpiece of cunning, perfidy, cruelty and all around wickedness. It was conducted with the rankest injustice. The victim was dragged into court without witnesses and without any information as to what was the charge against him. He was not allowed an attorney or the presence of friends, but under the cruelest torture it was demanded that he recant his heresies, oftentimes not knowing what the item in the charge of which he was to recant." -Page 137 of Uncle Sam or the Pope - Which by Rev L. L. Pickett. Nazi Funeral with Catholic Alter Boys Hitler Signing Autograph for Nun "Heil Rome!" "Hitler, Goebbels, Himmler and most members of the party's "old guard" were Catholics", wrote M. Frederic Hoffet. "It was not by accident that, because of its chiefs' religion, the National-socialist government was the most Catholic Germany ever had... This kinship between National-socialism and Catholicism is most striking if we study closely the propaganda methods and the interior organisation of the party. On that subject, nothing is more instructive than Joseph Goebbel's works. He had been brought up in a Jesuit college and was a seminarist before devoting himself to literature and politics... Every page, every line of his writings recall the teaching of his masters; so he stresses obedience... the contempt for truth... "Some lies are as useful as bread!" he proclaimed by virtue of a moral relativism extracted from Ignatius of Loyola's writings..." Frederic Hoffet: "L'lmperialisme protestant" (Flammarion, Paris 1948, pp.172 ss). 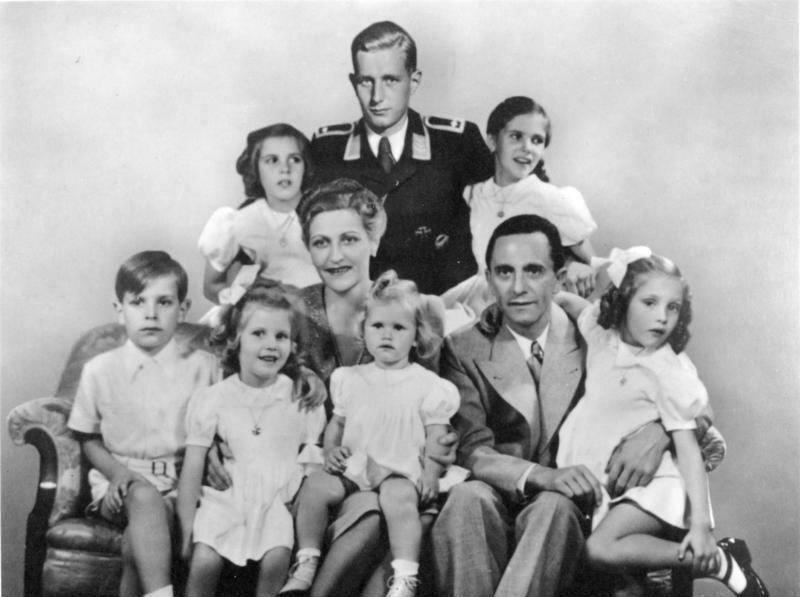 Joseph Goebbels was born into a strict Catholic, working-class family from Rheydt, in the Rhineland, on 29 October 1897. He was educated at a Roman Catholic school and went on to study history and literature at the University of Heidelberg. Goebbels was exempted from military service during World War I because of a crippled foot - the result of contracting polio as a child. 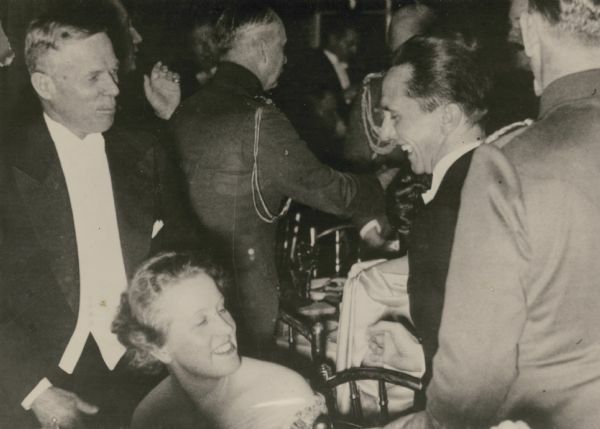 Reception at the German Embassy to the Holy See: Joseph Goebbels in conversation with (to the right) the German Ambassador to the Holy See, Diego von Bergen and Cardinal Steinmann ~May 31, 1933. Cardinal (or Monsignor Steinmann) was Ecclesiastical Counsellor to the German Embassy on behalf of the Holy See. "The S.S. organisation had been constituted, by Himmler, according to the principles of the Jesuits' Order. Their regulations and the Spiritual Exercises prescribed by Ignatius of Loyola were the model Himmler tried to copy exactly... The "Reichsfuhrer SS"—Himmler's title as supreme chief of the SS—was to be the equivalent of the Jesuits' "General" and the whole structure of the direction was a close imitation of the Catholic Church's hierarchical order. A mediaeval castle, near Paderborn in Westphalia, and called "Webelsbourg", was restored; it became what could be called a SS monastery". "I can see Himmler as our Ignatius of Loyola" ~Adolf Hitler: "Libres propos" (Flammarion, Paris 1952, p.164). Heinrich Himmler (Center with glasses). The son of a pious, authoritarian Roman Catholic schoolmaster who had once been tutor to the Bavarian Crown Prince. 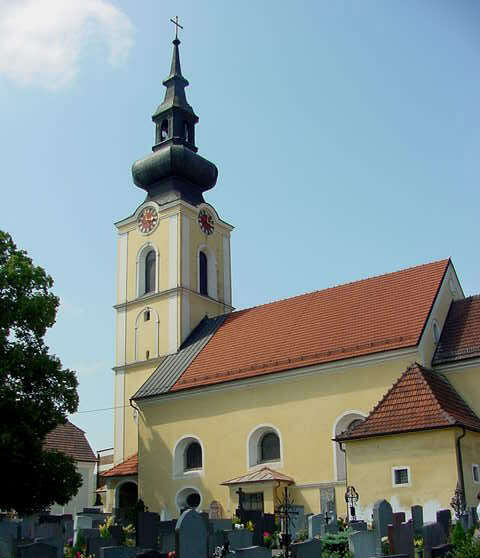 His mother, Anna Maria Himmler (maiden name Heyder), was also a devout Catholic. Kurt Heinrich Himmler, Reichsfuhrer of the SS, Gestapo and German police forces, seemed to be the one most impregnated by clericalism amongst the Catholic members of Hitler's entourage. His father had been director of a Catholic school in Munich, then tutor of Prince Ruprecht of Bavaria. His brother, a Benedictine monk, lived at the monastery of Maria Laach, one of the Pan-German high places. He also had an uncle, Jesuit Himmler, who had held the important position of Canon at the Court of Bavaria. The German author Walter Hagen gives also this discreet information: "The Jesuits' general, Count Halke von Ledochowski, was ready to organise, on the common basis of anti-communism, some collaboration between the German Secret Service and the Jesuit Order". (121) As a result, within the SS Central Security Service, an organisation was created, and most of its main posts were held by Catholic priests wearing the black uniform of the SS. The Jesuit Father Himmler was one of its superior officers. After the Third Reich's capitulation, the Jesuit Father Himmler was arrested and imprisoned at Nuremberg. His hearing by the international tribunal would have apparently been most interesting, but Providence was keeping a watchful eye: Heinrich Himmler's uncle never appeared before that court. One morning, he WAS FOUND DEAD IN HIS CELL, and the public never learned the cause of his death. Use of the symbol as a military insignia began with the cavalry of the Prussian army under Frederick the Great. Frederick formed Husaren-Regiment Nr.5 (von Ruesch), a Hussar regiment commanded by Colonel von Ruesch. These Hussars adopted a black uniform with a Totenkopf emblazoned on the front of their Mirletons and wore it on the field in the War of Austrian Succession and in the Seven Years' War. Frederick II January 24, 1712 – August 17, 1786) was a King of Prussia (1740–1786) from the Hohenzollern dynasty. In his role as a prince-elector of the Holy Roman Empire, he was Frederick IV (Friedrich IV) of Brandenburg. He became known as Frederick the Great (Friedrich der Große) and was nicknamed der alte Fritz ("Old Fritz"). What is the "Prince-Elector"? Princeps Elector (Latin) - were the members of the electoral college of the Holy Roman Empire, having the function of electing the Holy Roman Emperors. Philipp von Boeselager with painting of his brother, Georg Freiherr von Boeselager, in background. They were from an old military family, but also a devoutly Catholic one, and young Georg wavered before finally settling on the military over the priesthood Before this decision was final, young Boeselager attended secondary school at Aloysius College (Aloisiuskolleg) in Bad Godesberg. Beginning on April 1, 1934, he trained with the 15th Cavalry Regiment in Paderborn. When he completed his basic training in 1936, he was commissioned a Second Lieutenant; then in March, 1939, he was promoted to First Lieutenant. Georg Freiherr von Boeselager (August 25, 1915 – August 27, 1944) was a German nobleman and officer of the Wehrmacht, who ultimately served as Colonel (Oberst) of Cavalry. Born near Kassel to the Roman Catholic Boeselager family, Georg von Boeselager chose military service over the priesthood and enlisted with the German armed forces in 1934. In World War II, he served in the Heer with distinction in several notable offensives, including the 1939 Invasion of Poland, the 1940 Battle of France, and 1941's Operation Barbarossa, and was awarded the Iron Cross multiple times. He ultimately achieved the rank of Oberst and was made Instructor of Tactics at the "School for Shocktroops" in Krampintz. Along with his brother Philipp von Boeselager, he participated in the 1944 July 20 Plot to assassinate Adolf Hitler. Returning to the front after the failed plot, Boeselager was killed in action against a heavily fortified Russian position in 1944. On August 29, he was posthumously promoted to full colonel and awarded the Knight's Cross with Oak Leaves and Swords. Philipp Freiherr von Boeselager (born 6 September 1917) is the last surviving member of the July 20 Plot, a conspiracy among high-ranking Wehrmacht officers to assassinate German dictator Adolf Hitler in 1944. Boeselager is a member of K.D.St.V. Ripuaria Bonn, a Catholic student fraternity that belong to the Cartellverband der katholischen deutschen Studentenverbindungen. He still has the Walther PP pistol he was supposed to shoot Hitler with. The Grand Hospitaller's office includes the offices of Minister of Health and of Social Affairs, Minister for Humanitarian Action and Minister for International Co-operation. He co-ordinates and supervises the initiatives of Grand Priories and National Associations and other Order institutions world-wide involved in charitable and humanitarian actions, and ensures that Christian principles are respected. The Grand Hospitaller is assisted by a Council composed of representatives of the various territorial regions where the Order operates. He was born on October 4, 1949 in Kreuzberg/Ahr near Bonn; he is married, and has 5 children. He was educated in Bonn at the Jesuit college Aloisiuskolleg and graduated in Law in 1974 after studies in Bonn, Geneva and Freiburg. From 1968 to 1970 he served in the military force as reserve lieutenant. From 1976 to 1990 he worked as a professional lawyer. He was admitted to the Sovereign Military Order of Malta in 1976, and in 1985 became a Knight in Obedience. Since 1982 he has been the Chancellor of the German Association of the Order. Since the same year he has also been a member of the Executive Committee of the German Association's Ambulance Corps (Malteser Hilfsdienst). He was elected member of the Sovereign Council of the Order of Malta as Grand Hospitaller in 1989, and was re-elected in 1994, in 1999 and 2004. He has been a member of the Papal Council of the Pastoral for Health-Care Operators since 1990 and in the Pontificium Consilium Cor Unum since 1994. Von Boeselager is the son of Philipp von Boeselager and Rosa Maria, born Countess von Westphalen to Fürstenberg. Er ist verheiratet mit Praxedis, geb. Freifrau von und zu Guttenberg und Vater von fünf Kindern. He is married with Praxedis, born free and wife of Guttenberg and the father of five children. After graduating from the Aloisiuskolleg the Jesuits in Bonn, Germany, he studied law in Bonn, Geneva and Fribourg. From 1968 to 1970 he performed his military service and retired as a lieutenant from the reserve. From 1976 to 1990, Boeselager was as a lawyer and worked over by his father's 1987 agricultural and forestry operations. Von Boeselager was in 1976 in the Maltese Order, and 1985 Obödienzritter. Since 1982, he has been chancellor of the German Association of the Order. In March 1985, he was managing director and 14 Januar 1985 bis 30. January 1985 to 30th April 1990. April 1990 honorary head of the Malteser Hilfsdienst service in the archdiocese of Cologne. In addition to his work in the Bureau of the Malteser Hilfsdienst Service and the Board of the Maltese eV he heard since 1989, the Order government in Rome as Grand. After his 1989 election, he was 1994, reelected in 1999 and 2004. In addition, von Boeselager since 1990 member of the Pontifical Council for Pastoral Health Services, and since 1994 a member of the Pontifical Council Cor Unum. A Papal Nuncio (officially known as an Apostolic Nuncio) is a permanent diplomatic representative (head of diplomatic mission) of the Holy See to a state or international organization (e.g., the Arab League), having the rank of an ambassador extraordinary and plenipotentiary, usually with the ecclesiastical rank of titular archbishop. Under the 1961 Vienna Convention on Diplomatic Relations, a papal nuncio is an ambassador like those from any other country. However, the Vienna Convention on Diplomatic Relations allows the receiving state to grant seniority of precedence to the papal nuncio over others of ambassadorial rank accredited to the same country, and may grant the deanship of that country's diplomatic corps to the nuncio regardless of seniority. 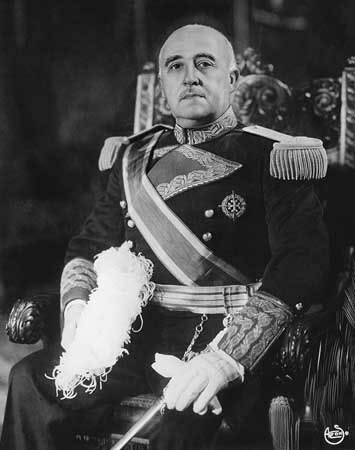 As nuncio during the 1920s, he had made unsuccessful attempts to obtain German agreement for such a treaty, and between 1930 and 1933 he attempted to initiate negotiations with representatives of successive German governments, but the opposition of Protestant and Socialist parties, the instability of national governments and the care of the individual states to guard their autonomy thwarted this aim. In particular, the questions of denominational schools and pastoral work in the armed forces prevented any agreement on the national level, despite talks in the winter of 1932. Adolf Hitler was appointed Chancellor on 30 January 1933 and sought to gain international respectability and to remove internal opposition by representatives of the Church and the Catholic Centre Party. He sent his vice chancellor Franz von Papen, a Catholic nobleman and former member of the Centre Party, to Rome to offer negotiations about a Reichskonkordat. On behalf of Cardinal Pacelli, Prelate Ludwig Kaas, the outgoing chairman of the Centre Party, negotiated first drafts of the terms with Papen. The concordat was finally signed, by Pacelli for the Vatican and von Papen for Germany, on 20 July and ratified on September 10, 1933. Most agree that Orsenigo favored fascism, particularly Nazism and that he collaborated and supported the German war effort. 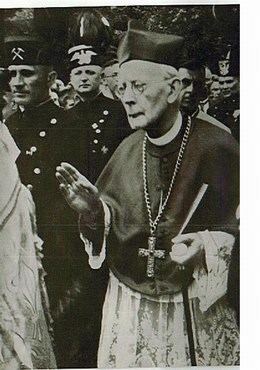 Seen as weak by Innitzer, and as a Pius XI loyalist by Pacelli, he failed to obtain a cardinalate in February 1946 and died in April during a return to Germany. 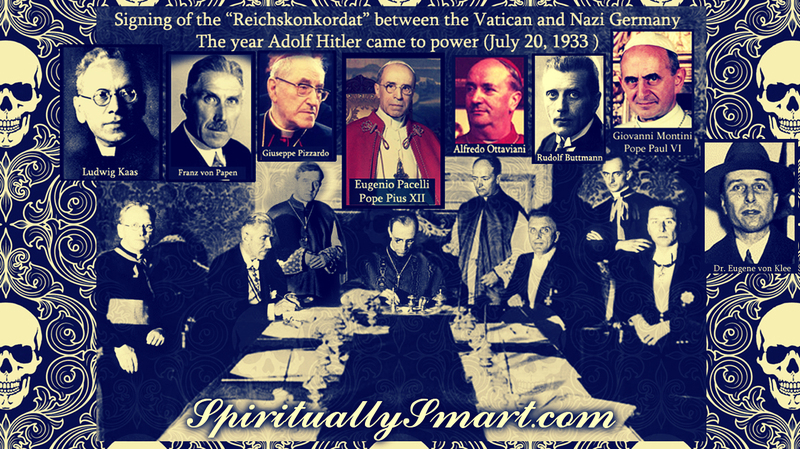 The Catholic Church hierarchy - especially Eugenio Pacelli, before and after he became Pope Pius XII - aided the Nazis. Indeed, Pacelli and the Church played a central role in making Hitler the dictator of Germany. 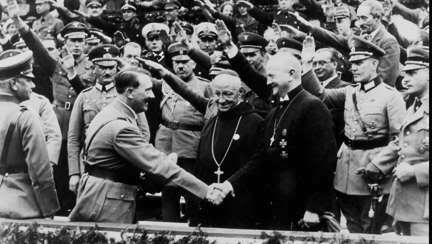 Hitler was a Catholic and put into power by the Vatican so that he would sign a concordat with them. Prior, the German government refused the Concordat more than twice and look what the vatican did to them for that. Look at how they were punished. They were manipulated and brought so much pain upon. Everything regarding Nazism came from Rome initially. Like the 'Nazi Salute' is really the 'Roman Salute'(More Pictures of 'Roman Salute') Hitler said his Nazi order was Fashioned after the Jesuit order and had transferred much of the Jesuit order into his own party. This is important. Please read about the concordat between Nazi Germany and the Vatican. Fascist Franco of Spain Generals coming up to kiss the Pope's ring finger expressing 100% submission in the Vatican in 1939. Pope Pius XII - Born Ugenio Maria Giuseppe Giovanni Pacelli AKA "Hitler's Pope"
Mussolini giving the Roman salute. Archbishop of Wroclaw from 1914 to his death, in 1916 appointed Cardinal, in 1945 at 86. He was President of the German Episcopal Conference; and spokesperson for the Bishops of Germany, holding ties with Hitler. He said, "warmest congratulations to the Fuhrer in the name of the bishops and the dioceses in Germany," "fervent prayers which the Catholics in Germany are sending to heaven on their altars". 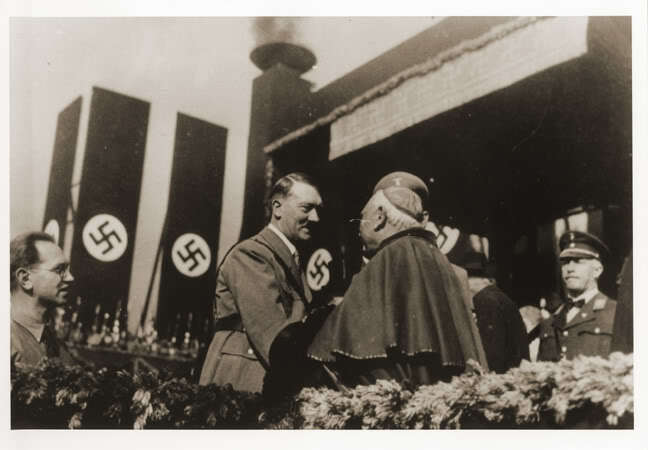 [Hitler's Pope: The Secret Life of Pius XII] He added concern to the pact with the Reich over their mistreatment of "non-Aryan Catholics" authoring the distinction between the Church and Nazism in which the Church maintained Judaism as religion, the Nazis as race. Joseph (Jozef) Tiso was a Roman Catholic priest who became a deputy of the Czechoslovak parliament, a member of the Czechoslovak government, and finally the leader of the "Independent Slovak Republic" from 1939-1945, which was a puppet state of Nazi Germany. After the end of World War II, Tiso was hanged by Czechoslovak authorities. Klaus Barbie (October 25, 1913 – September 25, 1991) was an SS-Hauptsturmführer, soldier and Gestapo member. He was known as the Butcher of Lyon. Klaus Barbie was born in Bad Godesberg, near Bonn, Germany. Barbie was born to a Roman Catholic family. He is best known primarily for one of his "cases", the arrest and torture of Jean Moulin, one of the highest-ranking members of the French Resistance. In April 1944, Barbie ordered the deportation to Auschwitz of a group of 44 Jewish children from an orphanage at Izieu. In 1947, Barbie became an agent for the 66th Detachment of the U.S. Army Counter Intelligence Corps (CIC). In 1951, he fled to Juan Peron's Argentina with the help of a ratline organized by the Ustashi Roman Catholic priest Krunoslav Draganović. Asked by Barbie why he was going out of his way to help him escape, Draganovic responded, "We have to maintain a sort of moral reserve on which we can draw in the future." He then emigrated to Bolivia, where he lived under the alias Klaus Altmann. Testimony of Italian insurgent Stefano Delle Chiaie before the Italian Parliamentary Commission on Terrorism suggests that Barbie took part in the "Cocaine Coup" of Luis García Meza Tejada, when the regime forced its way to power in Bolivia in 1980. While in Bolivia, Barbie managed a company that diverted Belgian and Swiss arms to Israel while Israel was still under a post-1967 war international arms embargo. "A report in the Israeli press alleges that Barbie also had frequent dealings with Israel concerning supplies of Israeli arms to Latin American countries and 'various underground organizations'"
of the Jerusalem Temple in 70 A.D. The Arch of Titus is located on the highest point of the Via Sacra, a road leading to the Roman Forum. This arch commemorates Titus' victorious conquest of Judea, ending the Jewish wars and leading the sacking of Jerusalem and the destruction of the second Temple of Solomon. The arch was constructed after Titus's death in 81 CE and, hence, after his becoming a god. It was probably built by this brother and successor, emperor Domitian but some believe that it was actually built by emperor Trajan because of similarities to the Arch of Trajan located at Benevento. This is a single arch, 15.4m high, 13.5m wide, and 4.75m deep. The marble reliefs stand nearly 2.5m in height. the Spanish inquisition and other times. "The Vatican was so appreciative of being recognized as a full partner (with Hitler and the Reich) that it asked God to bless the Reich. 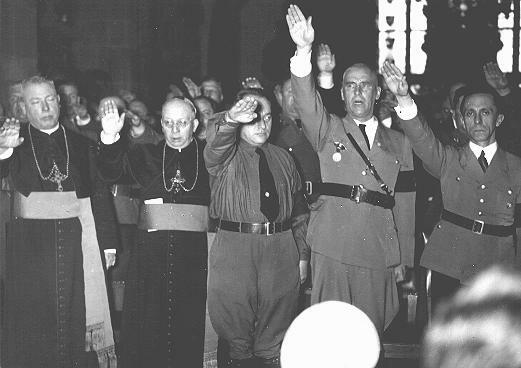 On a more practical level, it ordered German bishops to swear allegiance to the National Socialist regime. The new oath concluded with these significant words: ‘In the performance of my spiritual office and in my solicitude for the welfare and the interest of the German Reich, I will endeavor to avoid all detrimental acts which might endanger it’” (op. cit., pp. 430-432. Book listed below). In 1926 Hitler said, “Christ was the greatest early fighter in the battle against the world enemy, the Jews…. The work that Christ started but could not finish, I—Adolf Hitler—will conclude” (John Toland, Adolf Hitler, p. 302). He did not consider Jesus a Jew, but only a half-Jew, because He was begotten by God. He was obviously being used by the god of this world—Satan—and his demons (2 Corinthians 4:4). Most are ignorant of the spirit world because people refuse to know God and the devil! Hitler said, “We are not a movement, rather we are a religion …. I’m going to become a religious figure” (Waite, op. cit.). Even Hitler’s “thousand year Reich” was a religious belief based on the 1000-year biblical Millennium. It is truly amazing that the world knows so little about the satanic power which was behind Hitler. So much has been written, but not understood. “The colossal Assembly Hall planned for his new capital of Germania should be seen as a secular cathedral rather than a civic building. The dome was to be large enough to encompass the dome of St. Peter’s seven times—a favorite number. As Albert Speer has noted, ‘It was basically a hall of worship…. Without such cult significance the motivation for Hitler’s main structure would have been senseless and unintelligible …’” (ibid., p. 32). Those people close to Hitler have told the world about his satanic religion. Still, the world usually refuses to believe them! The murderous fruits of Hitler’s regime should make us see a sickness beyond the human realm! Humanity must learn the reality of Satan—either by word or by experience through suffering! Hitler was prepared for his job. Satan is the great counterfeiter. As God uses one man to lead His Church, so does Satan. The devil has a “very elect” also. Mr. Waite comments on a telling statement of Hitler’s: “‘Above all, I have learned from the Jesuit order.’ Certainly the oath of direct obedience to the führer was strikingly reminiscent of the special oath that Jesuits swear to the pope. Moreover, Hitler spoke of his elite ss, who wore the sacred symbol and dressed in black, as his Society of Jesus. He also ordered ss officers to study the Spiritual Exercises of Ignatius of Loyola for training in the rigid discipline of the faith” (ibid., p. 32). “The Vatican was so appreciative of being recognized as a full partner that it asked God to bless the Reich. On a more practical level, it ordered German bishops to swear allegiance to the National Socialist regime. The new oath concluded with these significant words: ‘In the performance of my spiritual office and in my solicitude for the welfare and the interest of the German Reich, I will endeavor to avoid all detrimental acts which might endanger it’” (op. cit., pp. 430-432). resurrections of the Roman Empire. Now it is happening once again in Europe. Many Catholics today don’t like to admit Hitler’s connection with Catholicism. We have written often about how most of the Nazi leaders escaped after World War ii through the Vatican “ratlines.” That is a well-documented truth. The highest leaders in the Catholic Church helped the worst criminals of the 20th century escape! That is not a holy relationship. That truth alone ought to electrify people into an intense concern about what is happening in Europe today! long. The time of blindness is about over. Adolf Hitler said the foundation of his philosophy was laid in Vienna. Why Vienna? What happened there? “Albert Speer, who knew Hitler best during World War ii, was convinced that the führer’s intellectual development stopped with the world as he had known it in Vienna in 1910” (Waite, op. cit., p. 14). Waite then continues in his book: “It is difficult to overstate the importance to Hitler of his commitment to anti-Semitism. It meant almost everything to him” (pp. 216-217). However, the biggest change in Hitler was not becoming a fanatical anti-Semite. That is only part of the story. This is where many people are deceived. Much of the world looks upon the Jews as God’s chosen people. In Vienna, Hitler came to believe that God had replaced the Jews with the Germans and the Holy Roman Empire. He believed the Germans were God’s chosen people. This is why the crown jewels of that empire meant so much to him. In 1938, at a rally in Nuremberg, “Hitler had brought from Vienna, after a hundred and forty years, the insignia of the First Reich—the Imperial Crown, the Orb of Empire, the Scepter and the Imperial Sword. At the presentation of these symbols of imperialism he solemnly vowed that they would remain in Nuremberg forever” (Toland, op. cit., p. 644). That was a strong statement. He “solemnly vowed” that the crown jewels of the Holy Roman Empire were to “remain in Nuremberg forever.” This is like a death-defying commitment to the Holy Roman Empire and his god! He made a vow for ever! When and where did Hitler become so fiercely loyal to the crown jewels? Logic tells us it had to happen while he was growing up in Vienna. Much of that information has remained underground. The god of this world wants that truth to remain hidden until he is once again ruling this great beast power (Revelation 13, 17). Hitler gave his most “inspired” speeches at the frenzied, torch-lit meetings in Nuremberg. That is where the crown jewels were. And where you find the crown jewels, Satan—the king—is near. Again, who is the real king of the Holy Roman Empire? “And there appeared another wonder in heaven; and behold a great red dragon, having seven heads and ten horns, and seven crowns upon his heads. And his tail drew the third part of the stars of heaven, and did cast them to the earth: and the dragon stood before the woman which was ready to be delivered, for to devour her child as soon as it was born” (Revelation 12:3-4). Satan is the ruler of those seven heads! He wore the six crowns of the Holy Roman Empire, and he is about to wear the seventh. He is the real king of the beast (see Revelation 13:4). He has the kind of power that led one third of the angels to rebel (Revelation 12:4). How much more he can do to puny men! Understand this significant truth! Hitler’s foundational lesson in Vienna was about the Holy Roman Empire! If we can’t learn that lesson by hearing God’s message, then we must learn it by becoming a victim. In his book The Young Hitler I Knew, August Kubizek reveals a teenage Hitler talking about personally solving homosexuality and other “social problems” when he established his Reich. According to Kubizek, the young Hitler was “absolutely convinced that one day he, personally, would give commands whereby hundreds and thousands of plans and projects he had at his fingertips would be carried out” (pp. 207, 212-213). Hitler was discussing rule over the world, even giving specifics of how he would do it! How could such a young man, a teenager, think such thoughts? Because he knew it had been done many times before by the Holy Roman Empire. Hitler considered the Jew to be the devil personified. In truth, the Jews have been specially commissioned to preserve the oracles of God (Romans 3:1-3). The oracles include the sacred calendar, knowledge of the biblical week, including the seventh-day Sabbath, and the Old Testament Scriptures. Jews suffered at Hitler’s hand more than any other race. Historically, the main victim of the Holy Roman Empire has been the spiritual Jews—or God’s Church (Revelation 6:9-11; 17:5-6). So Hitler’s hatred of Jews goes much deeper than the world has ever even imagined. The main force of this emotion is Satan’s hatred for God! the year 1918-1919 that Hitler resolved his identity problem and reached what he called ‘the most decisive decision of my life.’ For now, finally, he knew who he was and what he must do. He was the leader sent by destiny. He must answer the ‘voices’ that he said he heard—like Joan of Arc—distinctly calling him as he lay in his hospital bed. The voices told him to rescue his Motherland from the Jews who had violated her” (Waite, op. cit., p. 236). Hitler heard voices. He had a “supernatural vision which commanded him to save Germany.” Commanded? Of course he actually caused Germany’s destruction, but only because God intervened. He obeyed the command of his false god! He listened to and heeded the supernatural voice of Satan! Hitler knew this voice was not from men. But most people don’t know it! Most still refuse to understand. When are we going to wake up and understand the god of this world? How much suffering will it take? “He knew the power of his own slightly protruding, shining eyes, whose lashless eyelids added to their curiously hypnotic effect” (ibid., p. 5). didn’t notice anything else. Never in my life have I seen any other person whose appearance—how shall I put it—was so completely dominated by the eyes …. It was uncanny how those eyes could change their expression, especially when Adolf was speaking …. In fact, Adolf spoke with his eyes, and even when his lips were silent one knew what he wanted to say. When he first came to our house and I introduced him to my mother she said to me in the evening, ‘What eyes your friend has!’ And I remember quite distinctly that there was more fear than admiration in her words. If I am asked where one could perceive, in his youth, this man’s exceptional qualities, I can only answer, ‘In the eyes’” (Kubizek, op. cit., pp. 17-18). deeply shocked by the appearance of ‘a sick, almost senile old man.’ But the eyes were still effective: ‘Only in his eyes was there an indescribable flickering brightness … and the glance he gave me was strangely penetrating’” (ibid., p. 6). H.S. Chamberlain, after meeting Hitler, later told him, “It is as if your eyes were equipped with hands, for they grip a man and hold him fast” (ibid., p. 131). It is not natural to have shining eyes that can cast such a spell. Anybody who knows the Bible knows he was Satan or demon-possessed. In Ezekiel 28:11-14, God refers to an evil king and Satan interchangeably. That is because the king was either possessed or totally controlled by Satan—the god of this world. Satan has deceived the whole world about his power (Revelation 12:9). His eyes were not normal. Why? The first physical sign to indicate demon possession is through the eyes. How could such a ghastly experience not affect the eyes intensely? Love can be shown through the eyes. So can hate. The Bible describes the evil women of Israel as having “wanton eyes” (Isaiah 3:16). The Hebrew means they are “deceiving with their eyes.” Also their “countenance doeth witness against them” (verse 9). Nothing about the human body is more revealing than the eyes. People in this world see so much of Satan and know so little about him. He can be staring right at them and they don’t have a clue he is there. “Hitler did not like to be told that the ways of God were not always revealed to him. On one occasion an aide noted that ‘God does not let people look at the cards He holds.’ Hitler immediately broke forth into such a paroxysm of fury that he himself feared a heart attack. He gave orders that the aide never repeat the offensive phrase. “His convictions were reinforced by miraculous escapes from assassination. After the failure of the bomb plot of July 20, 1944, he told a naval aide, ‘Now the Almighty has stayed their [assassins’] hands once more’” (Waite, op. cit., p. 30). In early October of 1923, “While motoring in his new car through the Bavarian hills with Rosenberg and the Hanfstaengls, fog unexpectedly enshrouded the highway and the open red Mercedes lurched into a ditch. No one spoke on the way back to Munich, then he turned to Helene. ‘I noticed you were not at all frightened by our mishap. I knew we would not be injured. This will not be the only accident which will leave me unharmed. I shall pass through them all and succeed in my plans’” (Toland, op. cit., p. 200). Providence dictates for me with all the assurance of a sleepwalker” (Waite, op. cit.). This is a very disturbing statement—if you understand Satan and his powers. Hitler had no real control of his own mind! He totally depended on his god for guidance! This is very common in history. Satan rules this world through people. As Hitler totally yielded to Satan, he was given great power. “Other opponents observed the same phenomenon: a limp, little man changed into a force of overwhelming power, the stream of speech stiffening him ‘like a stream of water stiffens a hose’” (ibid., pp. 240-241). Mr. Waite says that as a youth, Hitler ate two pounds of chocolates a day. He also generally followed a vegetarian diet. Hitler was physically weak throughout his life. But during his speeches, he spoke with awesome power. After a speech at the Reichstag, an English observer, Major Francis Yeats-Brown, said this about Hitler: “During the rhetorical passages his voice mounted to the pitch of delirium: he was a man transformed and possessed. We were in the presence of a miracle” (Toland, op. cit., p. 598). It was a supernatural miracle! dead wrong. That was power beyond the human realm. Observers saw his “domineering manner” and noticed a “new phenomenon has entered the room.” “This thundering demon was not there before”! He was “possessed,” and it was a “miracle.” A “limp, little man changed into a force of overwhelming power”! Men saw the effect but didn’t understand the cause. They should have. All they had to do was believe God and His Word. Soon another man is going to appear on the scene with power even greater than Hitler’s. He will be possessed by a Satan full of wrath, a devil who knows he has but a short time before Christ returns (Revelation 12:12). What Hitler did was mild compared to what this man will do. “And in the latter time of their kingdom, when the transgressors are come to the full, a king of fierce countenance, and understanding dark sentences, shall stand up” (Daniel 8:23). He will have a “fierce countenance” and compelling, gripping, frightening, hypnotic eyes! “And his power shall be mighty, but not by his own power: and he shall destroy wonderfully, and shall prosper, and practise, and shall destroy the mighty and the holy people” (verse 24). He has a fearful power, but it is “not by his own power.” It is Satan’s power! And Satan is filled with his worst wrath ever! He is going to “destroy wonderfully,” or mightily. God’s holy people—spiritual Jews—are his main target. But what a glorious ending this black night has. “And through his policy also he shall cause craft to prosper in his hand; and he shall magnify himself in his heart, and by peace shall destroy many: he shall also stand up against the Prince of princes; but he shall be broken without hand” (verse 25). He appears to want peace. But it is only a deceit to suddenly destroy his lovers. Jesus Christ is going to destroy this evil empire forever. It’s time for men to awaken out of sleep and know for certain what is coming! That time is almost here. Clearly, Hitler’s power was beyond the human realm. But was his message from the Creator God? No, it was a religious message from another god—the god of this world. Herbert W. Armstrong said Satan is a thousand times more powerful than we are. But men refuse to even grasp Satan’s frightening power. If they can’t learn by words, they are about to learn by becoming victims—like the extermination camp victims of World War ii! Christ only prophesied of two great churches in the book of Revelation—His Church and Satan’s church, which rides the seven beasts of the Holy Roman Empire. Everything revolves around these two churches (see Revelation 12 in particular). God makes it very simple, while Satan complicates it and confuses deceived men. And yet the world is almost totally ignorant of both churches, to their own shame and terrible suffering! Hitler believed that God led him to force Austria into the Third Reich. The world watched and did nothing. Many Jews were so fearful that they committed suicide before the German army even arrived in Austria. And of course, hundreds more were slaughtered after the army entered. Hitler was led to commit this bloody sacrifice not by the Creator God, but by the evil god of this world. All of this was done in the name of religion. This is where the great deceit lies! When will we come to know the god of this world? Must we all become victims before we heed the warning? prepared to warn us this time. The people need a more specific focus to stir their imaginations. And they are getting just that. Mr. Habsburg, a descendant of the Habsburg Dynasty which ruled the Holy Roman Empire for 400 years, talked about a crown in a museum in Vienna, Austria, which symbolizes a great deal to the Germans. He said, “We possess a European symbol which belongs to all nations of Europe equally; this is the crown of the Holy Roman Empire, which embodies the tradition of Charlemagne.” Charlemagne was crowned emperor of the Holy Roman Empire in 800 a.d.—the First Reich. Can we see where Satan is taking them? It’s not necessarily a matter of where they want to go, it’s where Satan is leading them! Mr. Habsburg failed to mention that the Holy Roman Empire also embodied the tradition of Mussolini and Adolf Hitler—leader of the Third Reich. Europe is once again becoming mesmerized by the crown of Charlemagne—just as Hitler was. Pope John Paul ii said he wanted “to save Europe and the world from the final catastrophe”—the nuclear annihilation of every human being. But Satan is actually going to use the Roman Empire to plunge the world into a nuclear holocaust! That empire has always been used as a tool of great destruction. The end-time resurrection will be the most destructive ever—by far! Hitler provided only a small preview of the coming political beast that will initiate a nuclear holocaust. That power will cause the u.s. and Britain to suffer more than any people ever have on this Earth! What an incredible price we must pay for our ignorance and rebellion! Konrad Heiden wrote an introduction for an English translation of Mein Kampf. In it he made these statements: “Mein Kampf made Hitler rich. It became a best-seller second only to the Bible. The book may well be called a kind of satanic Bible …. The principle that men are not equal is the theoretical purpose of Mein Kampf …. Actually, people will not ponder this for centuries. Soon they are going to be taught the truth and understand the Holy Roman Empire. The satanic bibles and diabolical empires are about to be destroyed forever. Unfortunately, that will happen after many millions of people are killed by the seventh head. What is happening in the European superstate is a mystery to most of the world. But that mystery is beginning to be removed. Bernard Connolly wrote a bombshell book in 1995 entitled The Rotten Heart of Europe. For years he served at the heart of the Exchange Rate Mechanism for the European Union (EU). He headed the commission unit responsible for monitoring and servicing the system. He labels the European superstate as rotten. Why so? “It is the battle for control of the European superstate,” Mr. Connolly wrote, “in which French technocrats confront German federalists, both sides claiming to fight under the banner of Charlemagne. The ‘collateral damage’ from this battle lies mainly in the future, but it could be ghastly” (p. xvi). Who is going to get control of this great superstate? The battle can be narrowed down to two nations—France and Germany. Do knowledgeable people really doubt who will win this battle? The nation that controls the money will reign supreme. “Across the Rhine, successive German governments have, in their pursuit of a ‘European’ cloak for German ambitions, been prepared to accept an apparent cession of national monetary authority—as long as the new European monetary authority looks, sounds, smells and acts exactly as the German monetary authority now does” (ibid., p. 4). Just what are those ambitions? “The Bundesbank began to use this opportunity to the full, overturning its obligation to ‘support the general economic policy of the government.’ In 1966, it deliberately engineered a recession that dethroned the chancellor, Ludwig Erhard, who, as finance minister, had overridden Bundesbank objections to [Deutschmark] revaluation in 1961. The Bundesbank president of the time, Karl Blessing, commented with evident satisfaction that ‘we had to use brute force to put things in order‘—a formula not very different from those used by leaders of the military in Third World countries who summarily depose an uppity civilian leader before returning to barracks. It did not go unnoticed that the man who replaced Erhard, Georg Kiesinger, was, like many prominent figures in the Bundesbank at that time, a former Nazi Party member, however much or little significance that fact may have” (ibid., p. 9). Here he discusses just one German institution. In 1966 the Bundesbank had “many prominent figures” who were Nazis! Does this give us some idea of where the European superstate is headed? Are we afraid to face this book’s truth of what is happening in Germany and Europe? Do we fear to face Bible prophecy? just in the finance system. We are all aware of Hitler’s Third Reich. Mr. Connolly labels the empire of Charlemagne as the First Reich. Most of the eu leaders are working to “recreate the empire of Charlemagne. It was no coincidence that the Belgian government housed the offices and meeting rooms of the eu Council of Ministers in the Charlemagne building in Brussels. “It was no coincidence, either, that Giscard and Schmidt agreed to accept the Belgian compromise proposal at a bilateral summit in September 1978 at Aachen, principal seat and burial place of Charlemagne. The symbolism was heavily underlined in both France and Germany; the two leaders paid a special visit to the throne of Charlemagne and a special service was held in the cathedral; at the end of the summit, Giscard remarked that: ‘Perhaps when we discussed monetary problems, the spirit of Charlemagne brooded over us’” (ibid., p. 17). The spirit of Charlemagne has returned. This past king who ruled the First Reich had to wade through a “sea of blood” to achieve his goal of ruling Europe. The big question remains unanswered. “In the new empire of Charlemagne, who would play Charlemagne? Exactly the same question was implicit, and left unanswered, at Maastricht” (ibid.). Soon the world will know who the modern Charlemagne is to be. You can be sure he will have Germany’s stamp of approval. His actions will shock the world far more than the original Charlemagne. He will lead the world into the greatest “sea of blood” that humanity has ever seen or even dreamed about! Whether we realize it or not, the Fourth Reich has arrived. 500 and 900 men each. By fall of 1942, they had murdered approximately 1,500,000 Jews. But the death camps proved to be a better, faster, less personal method for killing Jews, one that spared the shooters, not the victims, emotional anguish. Indeed, the history of European unification has been one of much blood. Roman Herzog has long been one of Germany’s biggest promoters for European unification. He and many other European leaders frequently hearken back to Charlemagne as the inspiration behind modern-day unification. Very soon now, ten nations, or groups of nations, in Europe will band together in a union influenced by a great church. Everything about the union will seem right. The religion, the prosperity, the military might. But the final fruits of this union will be horrifying. History bears this out. Conspiracy, betrayal, bloodshed, intolerance, execution. These words best describe the “Holy” Roman Empire of the Middle Ages. Approximately 40 million people were butchered during the so-called Holy Inquisition—the papacy’s nightmarish vaccine for the “heresy” virus! The Roman and Spanish inquisitions virtually eliminated Protestantism in Italy and Spain! The world has probably never seen a more vile period than those dark and miserable years of the 14th, 15th and 16th centuries. God prophesied it long ago in the pages of the book almost no one reads and studies—the Holy Bible. Perhaps it is time we grab that book from the shelf, blow off the dust and crack it open. You’ll be shocked at how accurately God predicts the future.